The best fitted Gloves - Made according to the theory of ergonomics. This Ergo Grip technology has been applied to the registration for Patent in Japan, and also has been applied to the registration for PCT internationally by Matsuoka Glove Co., Ltd. This technology brings a highly specialized and technical feature to high end sport specific gloves. Benefits added by Ergo Grip enhance existing glove models and add significant function, value & satisfaction. These gloves have been designed to conform to the human hand in the most relaxed and naturally curved shape, which reduces the tension of muscles that grip and enables wearers to enjoy activities much longer without feeling fatigue. This technology clearly offers the greatest fitting and most comfortable, functional and best griping gloves in the world. Matsuoka Glove Co., Ltd. was awarded for GRAND PRIZE on June 6, 2008 Japan Leather Award 2008. 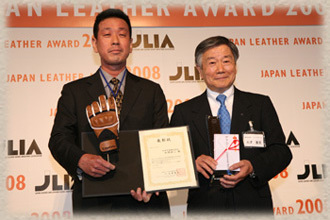 Matsuoka Glove's Ergo Grip was awarded for GRAND PRIZE at Japan Leather Award 2008. JAPAN LEATHER AWARD is recognized as the annual event for activating the domestic fashion-related leather goods industry. The main purpose of this event is to pick out and bring up talents of designers in the industries. It shapes the future of fashion. About 10 buyers in the industries judge the nominees. JAPAN LEATHER AWARD is hosted by JAPAN LEATHER AND LEATHER GOODS INDUSTRIES ASSOCIATION. Matsuoka Glove's Ergo Grip has won Best Technology Award in Fashion Access Fair at the APLF in 2009, the world wide initiative to cultivate and nurture talent and creativity in fashion-related industries. The Ergo Grip won high praise at the year's event for its outstanding technology and its use of ergonomic materials to improve form and function of sports gloves, while incorporating a strong fashion element. ASIA PACIFIC LEATHER FAIR, Materials, Manufacturing, & Technology held each spring at the Hong Kong Convention & Exhibition Center. 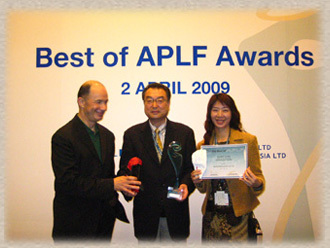 The 25th Anniversary of the APLF - Materials, Manufacturing and Technology (MMT) was held on 31 March to 2 April 2009. APLF is both the largest and the most international exhibition servicing the global leather industry and its many off-shoots, such as garments, footwear, travelware and fashion accessories. Today APLF is recognized as the annual meeting place for the entire leather industry, from raw hides and skins, exotic leathers, upholstery leathers, synthetic materials, dyes and chemicals to tanning and shoe-making machinery, CAD/CAM software and systems, and inspection and certification services, etc.